Spring Today — Ice Tomorrow! Enjoying their moment in the sun. It was 71 degrees Fahrenheit at my house this afternoon. Frogs chorused, birds rejoiced, and flowers bloomed with abandon. This happy gardener was out sowing more seeds in her little greenhouse, weeding the spring vegetable beds in preparation for spring crops, and planting two new woody additions to the landscape. It was heavenly. I’ll be clinging to the memory of this lovely day this week, as Winter comes roaring back at me. Freezing rain and sleet tomorrow, then snow?! Really? Nature does love her little practical jokes this transitional time of year. 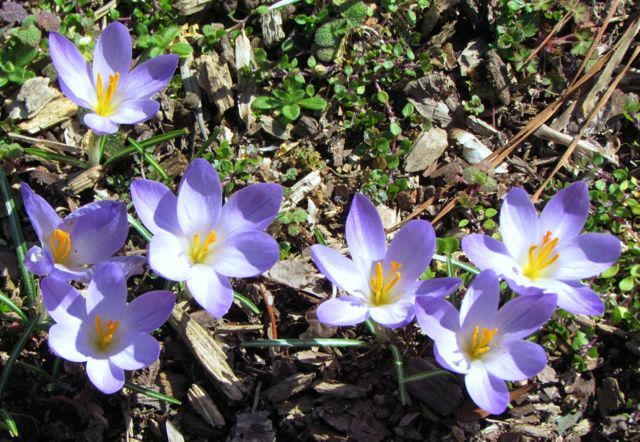 At least I had today, as did the pretty crocuses above. I hope they enjoyed their moment in the sun as much as I did. 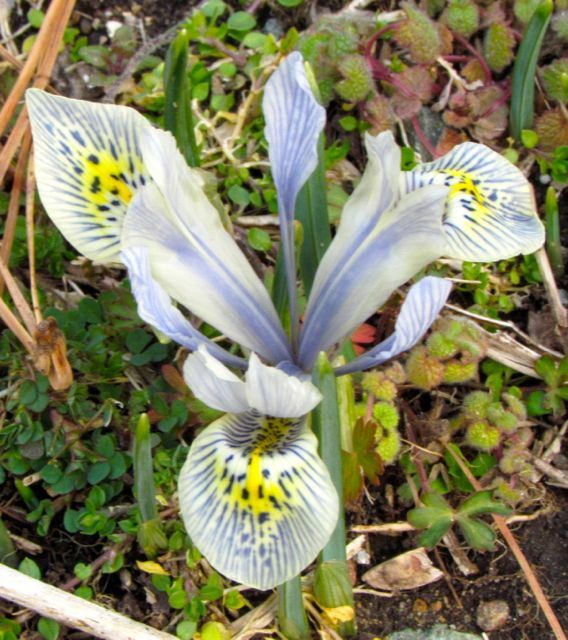 Also blooming today were my dwarf crested iris. Five pale lavender beauties were open for business. Alas, they too will be but a memory after the ice is done with them. I’m so glad I was able to appreciate them today! I am grateful I had this break in the weather to plant my latest additions to the landscape. I was recently showing some folks around my garden and mentioned that I was growing all the native big leaf magnolia species except M. pyramidata, because my specimen had failed to thrive, then died. This, of course, prompted me to check and see if my favorite source for native woodies — Woodlanders — happened to have this tree in stock. They did! I ordered it on Feb. 22. They shipped it on Feb. 25, and it arrived in perfect condition on Feb. 27. Major props to Woodlanders! These folks were hammered by a recent ice storm, but managed to get their operation back up and running quickly, just in time for their rush season. They ship only bare-rooted plants, so they stop shipping at the end of March. They do have a minimum order requirement, so I was forced — forced, I say (ahem) — to purchase another plant to meet that requirement. My eyes went straight to their fantastic array of native deciduous azaleas, the source of most of my plants that are thriving and blooming so well. 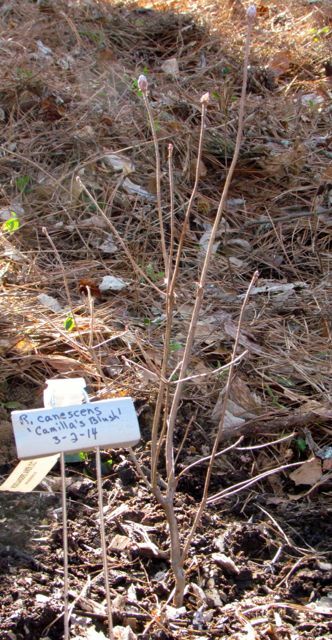 After a careful perusal of my options, I settled on Rhododendron canescens ‘Camilla’s Blush.’ This species is often called Piedmont Azalea and is well-adapted to my region. This cultivar is described as producing especially lovely, abundant, fragrant pink flowers. I think it will fit in very nicely with the rest of my native azalea collection. 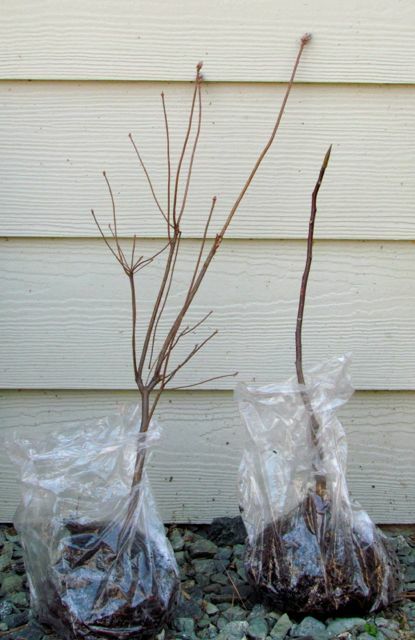 Woodlanders wraps the moist roots of the plants they ship in plastic bags held tightly together by rubber bands. Branches are protected during shipping by balled-up paper snugly tucked in all around them. As always, these two newbies were fully dormant and undamaged when I opened their box. Because I didn’t plant them for a couple of days, I opened up the plastic bags to let the roots breathe and kept the plants in my cool garage until planting time. Here they are leaning against my garage before I carried them to their new permanent homes. I was delighted to see that Camilla’s Blush actually had three flower buds on it. Usually I have to wait at least a year to see the flowers from a new azalea from Woodlanders, because they do ship small plants, so this is a bonus. If my past experience with other big leaf Magnolia species from Woodlanders holds true for this new species, it will likely be seven or so years before I see a flower on it. That’s OK; they are totally worth the wait. I had already picked out perfect spots for the two new arrivals inside the deer-fenced area on the north-facing side of my yard. This is where all my big leaf Magnolias and most of my deciduous azaleas are thriving. Abundant winter rains and naturally wonderful soil made for easy digging. The new plants were both tucked in and mulched in half an hour. Wonder Spouse insists that I label all new arrivals. I concede that this is a good idea, given the number of specimens we’ve accrued. Rhododendron canescens ‘Camilla’s Blush’ is tucked under a mature dogwood and a lofty loblolly pine. I think she’ll be very happy there. I am hoping that the new arrivals will forgive me for the icy coating they will receive tomorrow. They should, because they are still fully dormant, I mulched them well, and they are sheltered from the worst of the weather by tall pines to their north. Still, I wish their welcome could have been a bit less brutal. 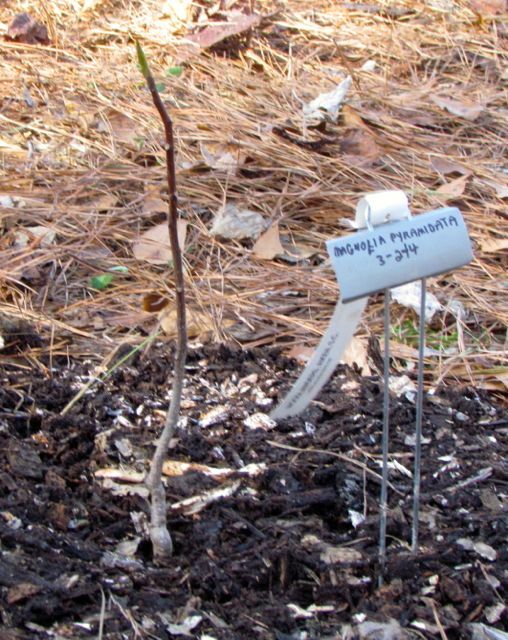 This entry was posted on March 2, 2014, 8:34 pm and is filed under Favorite Plants, piedmont gardening. You can follow any responses to this entry through RSS 2.0. You can skip to the end and leave a response. Pinging is currently not allowed.